Shopping for everything online, especially electronics and gadgets, is not a novelty anymore. That’s why it’s always good to see well-known stores go online. Brookstone is one of the stores that’s been around for decades. Brookstone is a countrywide store that offers a variety of electronic consumer items. They also have a huge website which lists thousands of products. What follows is an overview of this retailer and how they have now one of the biggest and most well-respected online shopping experiences in the whole of the United States and North America. Right from the start, quality of the products, service quality, and excellent customer service have been a hallmark of Brookstone. Their very first catalog comprised of 24 black-and-white directories (postal-only), with detailed, no-nonsense info on features, specs, dimensions, and more – which back in the 1970s was all a customer really expected. As Brookstone’s success increased, its scope broadened. In 1973, Brookstone opened up its first store in Peterborough, where an unexpected walk-in trade rapidly developed. Initially a catalog company, Brookstone today works as a multifaceted Direct-Marketing business which includes catalogs, e-mail and internet affiliate marketing, and an internet site offering thousands more items than can be found on most other eCommerce websites –with exception to Amazon of course. 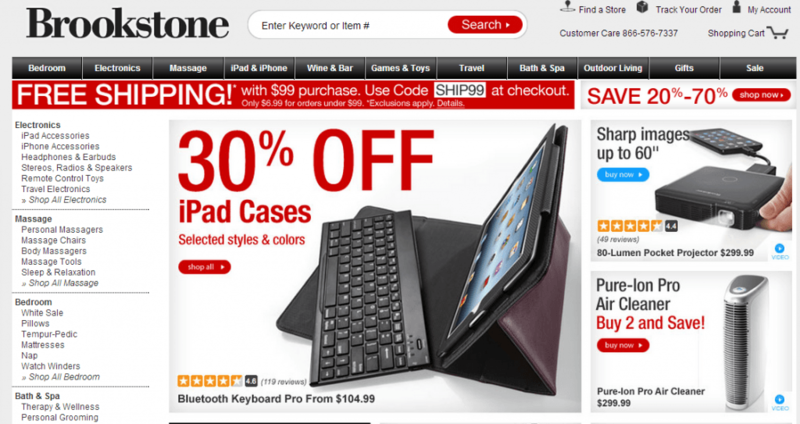 Jumping forward to 2013, and Brookstone.com is now one of the biggest websites in terms of revenue and traffic. The navigation is clear and easy to use, with various promotional call to actions spread throughout the website. Adding an item to your shopping cart is easy and can be done in one click. After that the check out process can be completed either as a logged in customer (already existing) or as a guest. Both take no time at all and the credit card section is run over secure HTTPS meaning there are no worries about your personal details becoming compromised. The website also has another nice feature, which is the ability to use Brookstone promo codes. What you need to to is find Brookstone.com promo codes online, select the right deal and discount for you (there are loads of coupon code websites which publish these such as RetailMeNot etc.) based on your requirements and what you are buying. What you need to do is choose the discount coupon and then copy and paste it into the promo code box in the shopping cart. If you then click on the apply button to see how much discount you will get on your final check out price. There are sometimes limitations and guidelines before you use the Brookstone coupon, for example expiration date, because some codes are only valid for a very short time. Once you’ve finished shopping and you purchase arrives in the post you will have up to 60 days in which to return it with a full refund should you be unhappy. The customer service available online is second to none, with people available over email or the telephone should you wish to use it. I would give the Brookstone website a healthy 4 out of 5 as an online shopping experience – definitely worth bookmarking! It uses easy to access navigation, a simple shopping cart, the ability to get discounts using coupon codes, as well as superb customer service.